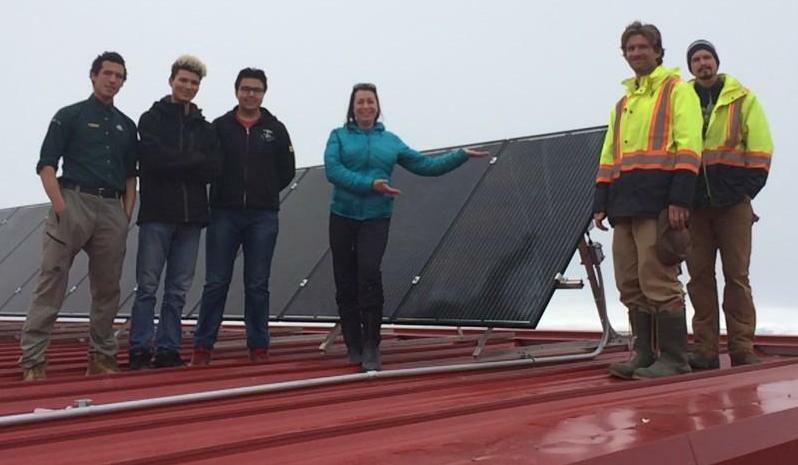 When residents of a remote Canadian village put in a community solar array, they needed a microinverter built for the toughest conditions. Did we mention the village of Pond Inlet, Nunavut, sits well above the Arctic Circle? Latitude 72N, to be precise – a challenging environment by any standards. 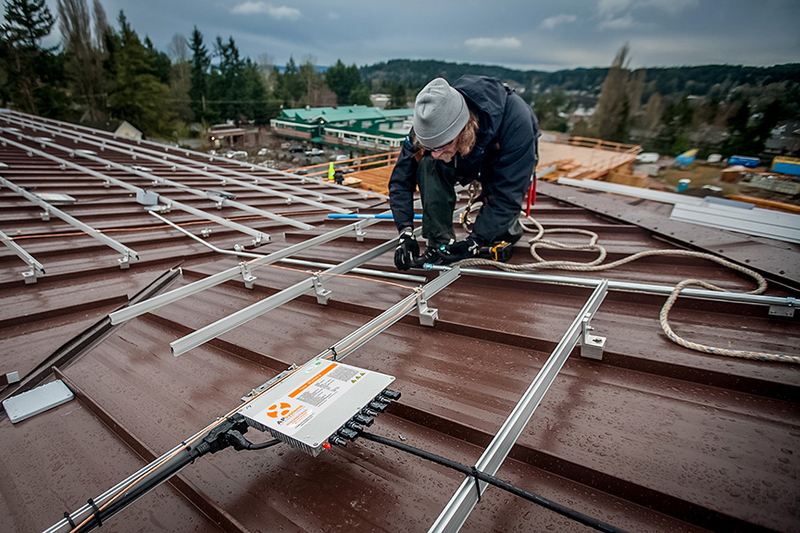 So the installer, Vancouver Renewable Energy Cooperative, chose APsystems YC1000 true 3-phase microinverters for the Pond Inlet Community Hall, now the northernmost grid-tied array in the Americas. In just three weeks beneath the Arctic sun, the 9.3kW system produced 590kWh of power, saving hundreds of dollars on the municipal power bill for a remote, 1,500-person hamlet that otherwise relies on fossil fuels for power – a real environmental win! Read the whole story here. These same rugged APsystems microinverters are available through Blue Frog Solar: the YC500 dual-module microinverter for residential installations, and YC1000 multi-module unit for demanding 3-phase commercial layouts. Remember that all our microinverters are backed by standard 10-year or buyer-option 25-year warranties from APsystems, a global leader in solar Module Level Power Electronics technology. Tough enough for the Arctic Circle, tough enough for the Pacific NW – choose APsystems microinverters from Blue Frog Solar for your customers today! Solar installers: Give your customers outstanding reliability and power – and extra value – with APsystems microinverters. The incentives for Washington made inverters may be going away, but Blue Frog Solar is working hard to bring you the lowest prices for one of the most advanced microinverters on the market today. Remember that all YC500 microinverters are backed by standard 10-year or buyer-option 25-year warranties from APsystems, a global leader in solar Module Level Power Electronics technology. Choose Blue Frog Solar and APsystems with confidence! Registered installers can login here to see our current pricing, with discounts offered for volume orders. Contact Blue Frog Solar and place your order today for prompt fulfillment. APsystems is rolling out the next-gen YC600 microinverter, a dual-module, smart grid and Rule 21 compliant unit – and Blue Frog Solar will have it! A groundbreaking design in microinverter technology, the YC600 will offer the highest peak output with faster transmission speed. A wider MPPT voltage range means greater energy harvest for homeowners. The YC600 is designed for today’s high-output PV panels, rated for modules up to 365W, enhanced to meet the latest grid compliance standards while providing unprecedented power and dual, independent MPPT. This bold new unit builds on the highly successful APsystems line of multi-module microinverters, simplifying installation and reducing logistics costs. Blue Frog will have the APsystems YC600 available to ship in late Q4 – watch for more information soon about pricing, and get ready to bring this powerful new microinverter to your customers! 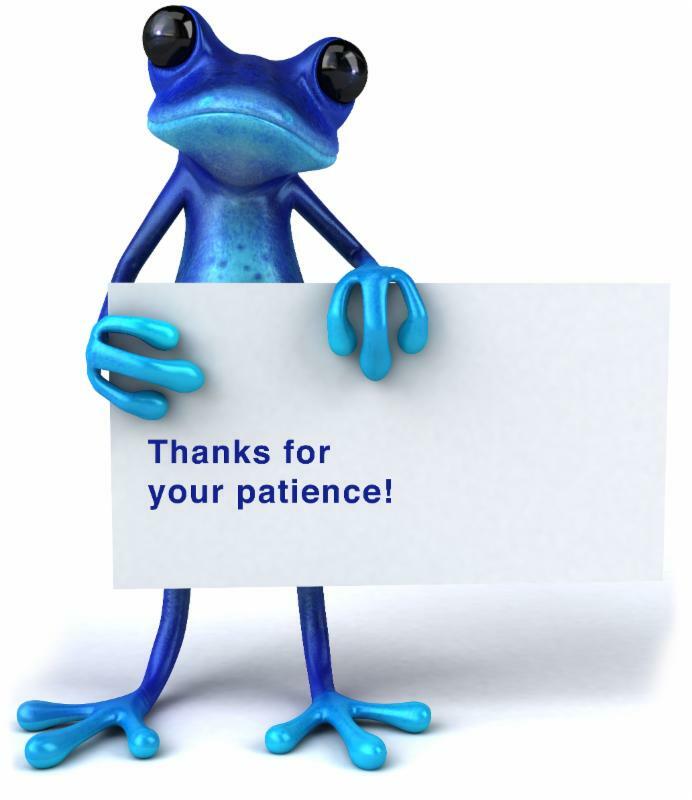 Thank You to all our customers for the tremendous surge in demand for our Blue Frog microinverters. Demand is so strong, our supply and production lines are overwhelmed. A component that is critical to our production has been delayed on the water for about 10 days, during which we will not be able to deliver any product. After that we will be catching up as quickly as possible for the next 2-3 weeks. We will be filling current orders first before we can deliver new ones. Please bear with us as we catch up with orders. 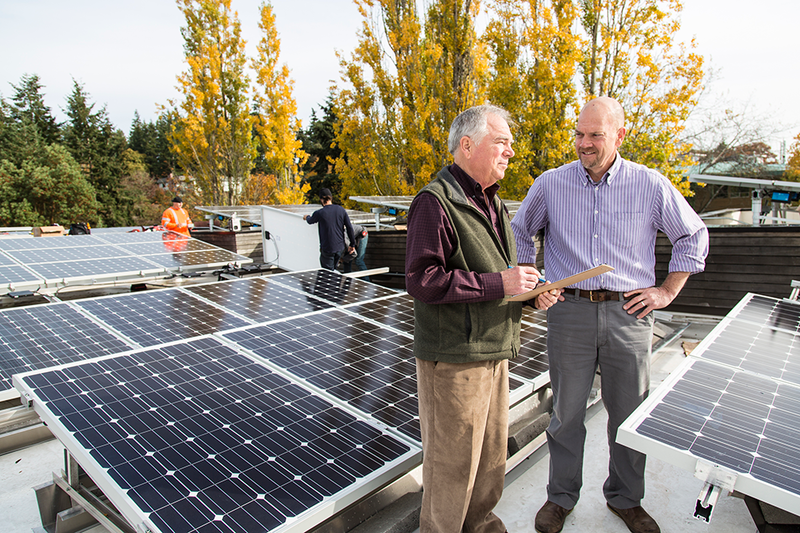 Again, Thank You for your business and support of our certified MIW solar equipment, and for making Washington state a leader in consumer solar. 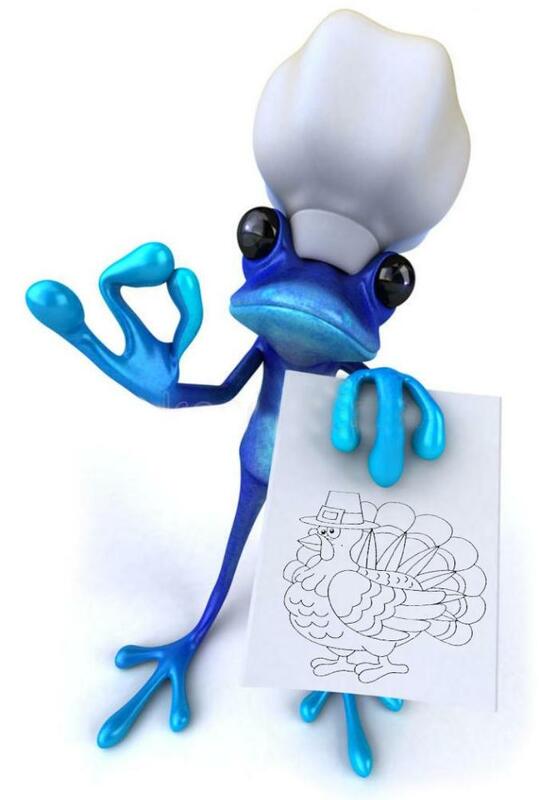 Northwest Solar Installers: Blue Frog’s supplier has cut prices, and we’re passing the savings along to YOU! That’s right – you and your customers can save big as we lower prices once again on our certified Made In Washington microinverters and black-label units. Also in stock: The new APsystems YC500i with EnergyMax™ power handling and integrated ground for today’s high-output PV modules. EnergyMax™ technology allows the dual-module unit to produce 274 watts peak output per side (548W total), an almost 10 percent increase over standard micro inverters. We also have the groundbreaking APsystems YC1000, the first true 3-phase, 4-module microinverter designed and built for challenging commercial applications. All of these tough, reliable units are now offered at our lowest pricing ever – and you can save even more on volume orders. Call us today to find out how. Remember that all of our microinverters are backed by standard 10-year or buyer-option 25-year warranties from APsystems, a global leader in solar Module Level Power Electronics technology. Registered installers can login here to see our new pricing. Then contact Blue Frog Solar and place your order today for prompt fulfillment. 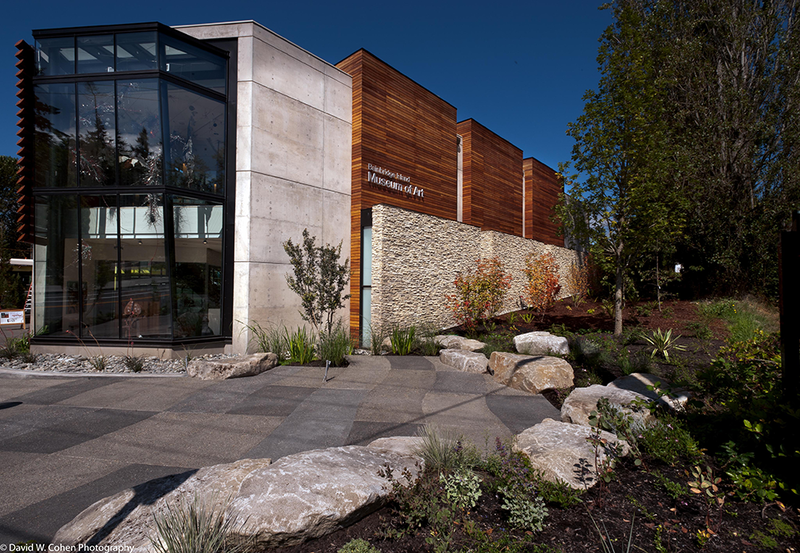 Bainbridge Island Museum of Art has earned the vaunted LEED Gold environmental certification, making it the first new art museum in Washington state to achieve the Gold rating. The certification is thanks to a newly expanded solar array using donated Blue Frog/APsystems YC500-MIW dual-module microinverters. This past fall the museum nearly doubled its array to 100 modules. The 28kW system caps a host of advanced sustainability features that extend from the roof down into the earth beneath the museum itself. “What’s thrilling about this achievement is that it affirms how deeply Bainbridge Island and the museum itself care about all aspects of community vitality and wellbeing,” said Sheila Hughes, BIMA Executive Director. “We live, work, visit and raise families in a place that invests equally and deeply in cultural enrichment and in sustainability. The U.S. Green Building Council’s LEED certification – for Leadership in Energy and Environmental Design – is a progressive code that rates new buildings for sustainability and promotes eco-friendly construction techniques. Designed by Bainbridge architect Matthew Coates, of Coates Design Architects, BIMA earned high marks for innovation in design, indoor environmental quality, water efficiency, and site sustainability. General contractor PHC Construction worked with the museum staff to secure LEED Gold certification. The expanded PV array provided the final “points” required under the LEED scoring system. 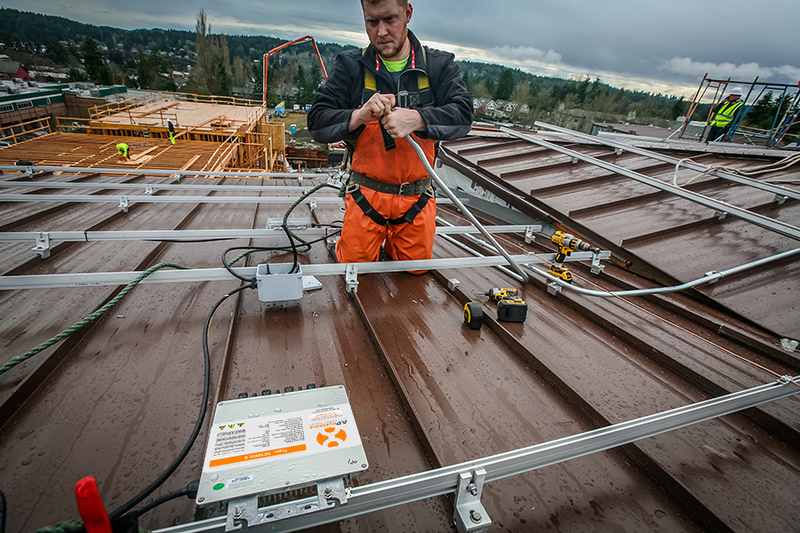 The array uses certified Made In Washington solar products, including Blue Frog/APsystems YC500-MIW microinverters and iTek Energy 240W and 280W modules. Itek provided the modules at cost, while the micoinverters were provided Blue Frog free of charge. Several other private donors stepped in so that the solar project had no effect on the non-profit art museum’s budget. 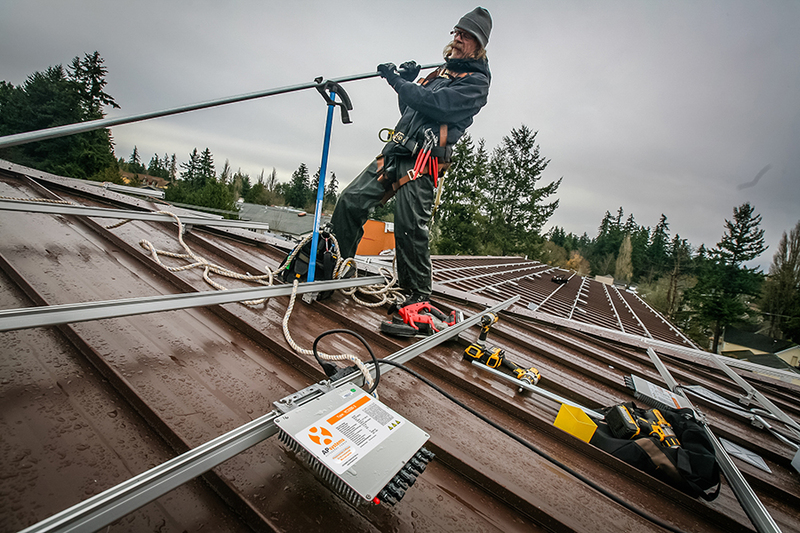 Installer was Puget Sound Solar of Seattle. BIMA opened in June 2013 to showcase contemporary Northwest art and has been an unqualified success, recently welcoming its 250,000th visitor. Architect Matthew Coates designed the museum to embody forward thinking in both aesthetics and sustainable materials and systems in a facility-scale building. That commitment started below ground. A geo-exchange system uses 14 bores beneath the foundation to reduce the energy used for heating and cooling the building. Drilled 400 feet, the bores act as a heat sink and source at a constant ground temperature of approximately 50 degrees. The system is designed to reduce heating and cooling energy by 90 percent, and to cut peak heating and cooling loads in half. Thanks to the musuem’s sunny southern exposure, nearly all of the publicly occupied spaces enjoy generous natural light to further reduce energy usage for lighting. A sophisticated louver system across the two-story glass façade tracks solar angles to reduce heat gain and glare inside. Low-flow water fixtures inside and Northwest climate-appropriate landscaping reduce water demand. During construction, 95 percent of construction waste was recycled, while more than 20 percent of new materials came from recycled sources. All paints, sealants and materials were selected to be non-toxic. The site itself, on a prominent corner near the ferry terminal that connects the island with downtown Seattle, was reclaimed from a former automotive business. During site preparation, numerous scrap automobiles and many hundreds of spent tires were excavated from the property and recycled. The art museum exhibits, interprets, preserves, collects and promotes works of proven cultural value as well as new those by emerging artists and craftspeople. 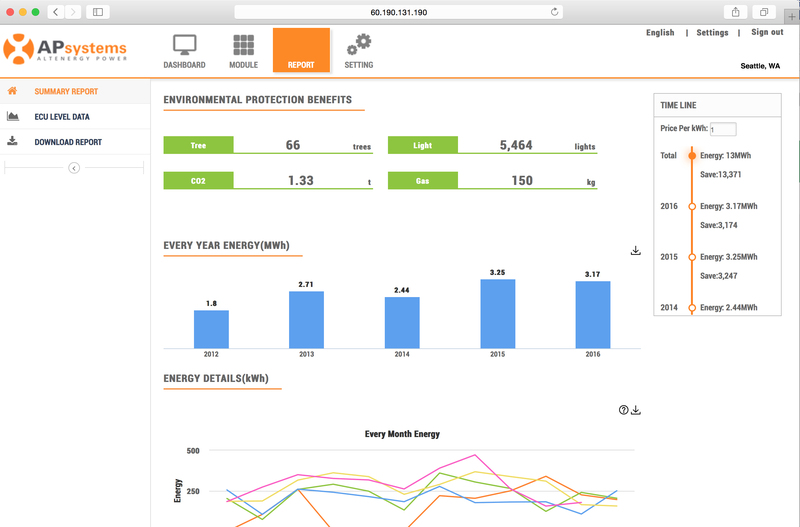 Blue Frog Solar installers: APsystems has launched a new, redesigned version of its Energy Monitoring & Analysis (EMA) website APsystemsEMA.com. The web-based platform, available for free on any connected device, monitors and reports module-level energy production of solar arrays that utilize Blue Frog/APsystems microinverters, and provides that information to homeowners and end users in a convenient and user-friendly format. The site also enables APsystems-registered solar installers and contractors to lower their maintenance costs by creating and managing their customers’ PV installation accounts remotely. Key features of the new EMA site include a more attractive design and a more engaging user experience with an enhanced system dashboard, system management tools and improved reporting functions. The new EMA website is active and available now, the result of a seamless transition from the previous site to the new interface. The added functionality addresses the high demand for detailed data and enhanced capability in a more user-friendly experience for the growing and competitive solar industry. 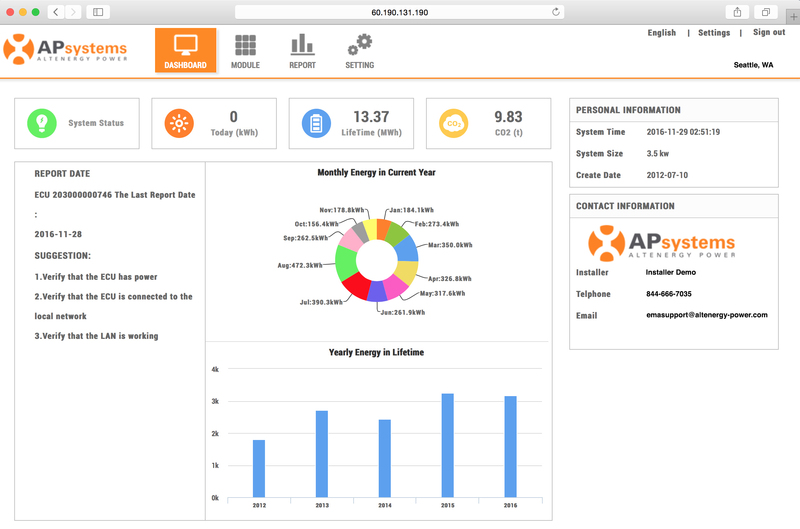 Users can view their solar array performance using the same URL and log-in information as before at APsystemsEMA.com, through the APsystems EMA App or by visiting the Blue Frog website at BlueFrogSolar.com and clicking “EMA Login” under “Resources”. Blue Frog Solar is cutting prices and offering new warranty options on our certified Made In Washington microinverters. We’ve dropped the top-tier pricing on our flagship YC500A-MIW to a new installer-friendly per-unit price – lower still if you order 250 or more units under Blue Frog’s volume rebate program. This dynamic new pricing represents a $25 per unit decrease on our most popular microinverter, while our standard warranty is now 10 years with a 25-year buyer option. This means installers can now quote a price with a warranty commensurate with a string inverter, and give the homeowner the option of paying another $25 to extend the warranty by 15 years. Order today to take advantage of this outstanding new pricing on our certified Made In Washington solar equipment. Also now in stock: The new APsystems YC500i with EnergyMax power handling and integrated ground for today’s high-output PV modules. EnergyMax™ technology allows the dual-module unit to produce 274 watts peak output per side (548W total), an almost 10 percent increase over other microinverters.Registered installers can login here to see new pricing. Contact Blue Frog Solar and place your order today for prompt fulfillment. Condos, apartments, townhomes – three flavors of multifamily construction, each with its own challenges for reaping the power, and financial benefits, of solar investment. 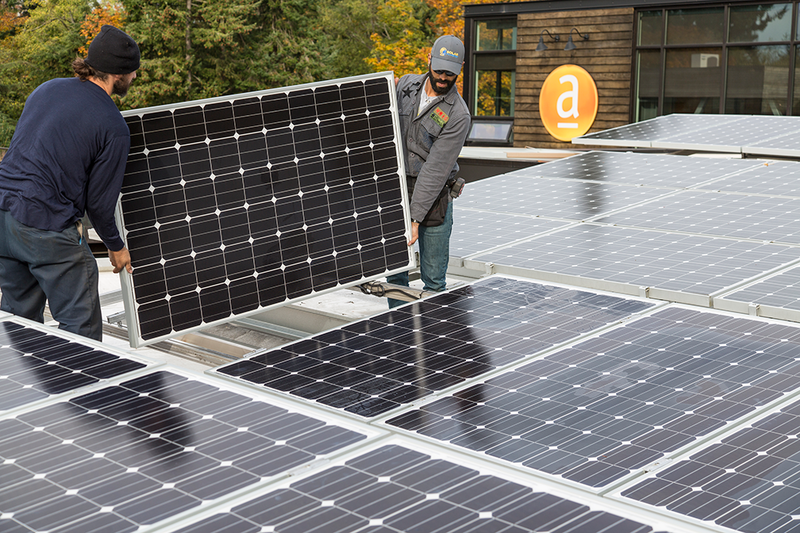 Asani development company is tackling all three at once at Grow Community on Bainbridge Island, with the help of Blue Frog/APsystems microinverter technology. 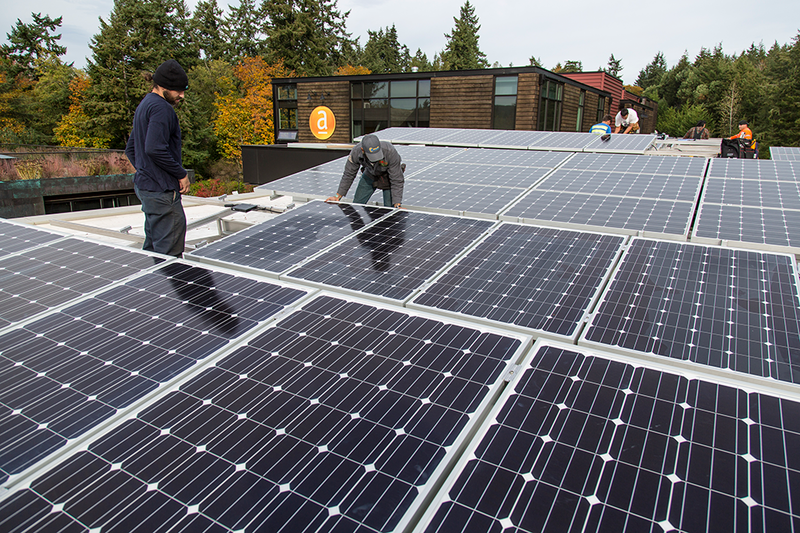 On buildings dubbed the Salal, the Juniper and the Elan, now complete in the project’s expansive second phase, solar arrays will benefit both homebuyers and renters alike. One roof apiece, with many beneficiaries beneath. The Salal condominiums, with 12 units spread over three stories, is effectively a “community solar” project on a rooftop. Solar was included in the purchase price – no buyer option – and incentives from the State of Washington will be apportioned equally among condominium owners. Each will own a one-twelfth interest in the array. Asani worked with state officials and the local utility provider to craft a program that satisfies the complicated provisions of Washington law. The opening was a provision allowing common use of single roof for solar in multifamily buildings. Asani banked on prospective buyers seeing shared solar as a good investment as they bought their condo units, one that promised annual paybacks while lowering operational costs of their building through solar harvest. Solar was designed into the Salal building. A single production meter monitors total system output, while 12 sub-meters track consumption in individual units for utility billing. Buyers are rolling the cost of solar, about $15,000 per unit, into their mortgages to take advantage of low interest rates at the time of purchase. Lotakis expects the 44kW array to produce about $1,500 in incentives per unit annually – cumulatively much higher than the state’s $5,000 cap on incentives for a single-family residence. Next door at the 12-unit Juniper apartment building, the 44kW rooftop array is similar but the equation is different. Renters will enjoy the benefits of solar production through net-metering, but not the annual state solar rebate. That will go to the building’s single owner, and will max out at the state’s $5,000 cap. The Juniper building array includes APsystems YC1000 true 3-phase microinverters distributed by Blue Frog Solar. The two-story Elan townhomes presented the most straightforward challenge. Individual 6-9kW solar packages are offered for each section of the common roof. No modules will cross the “virtual lot lines,” making each system self-contained within the owner’s patch of rooftop. Three systems have been installed so far, including Blue Frog/APsystems YC500A microinverters. From project inception, Asani set out to build the most environmentally friendly development possible. Relentless sourcing of renewable materials and low-impact fixtures, and close connection to the island’s town center, have positioned Grow Community in the marketplace for healthy lifestyle-conscious buyers. The project’s first phase is noted for its shared pea-patch gardens and winding footpaths through close-set homes. The second and third phases are oriented around a woodland grove and open greenway. The project has earned recognition in national magazines and won awards from local and national homebuilder associations. It is only the second planned community in North America to be certified under the rigorous One Planet Living standards. Grow’s first phase of 23 detached units sold out immediately, and every homeowner chose to add the solar package. Asani has also showcased Made In Washington components to support the state’s solar industry. Modules at the Salal are by Itek Energy of Bellingham, WA, while the Juniper and Elan arrays include Blue Frog/APsystems microinverters from Blue Frog Solar of Poulsbo. Using a mix of in-state and out-of-state components allows Asani to achieve different price points for buyers while optimizing local incentives where possible. Lotakis cautions that Grow Community’s multifamily solar program relies on particularities in Washington law. Multifamily programs elsewhere would face their own challenges, although he believes Grow offers a useful model for developers nationwide to consider. With the Salal building only recently certified for occupancy, new residents have no comparative data on their energy savings. But the solar component was attractive, as it has been to buyers throughout the three-neighborhood, 142-home project due to be completed in late 2017. Between the federal tax credit and annual rebates from the state, Lotakis said, owners buying into the Salal condominiums could have their share of the common array paid off within five years. Solar Builder Magazine’s new “Rooftop Report” is out, featuring APsystems advanced microinverter technology. APsystems Director of Engineering Christopher Barrett contributes “Get Connected: Data Monitoring in a Wireless (and sometimes wired) World,” an in-depth look at the challenges of gateway data collection in the home solar environment. 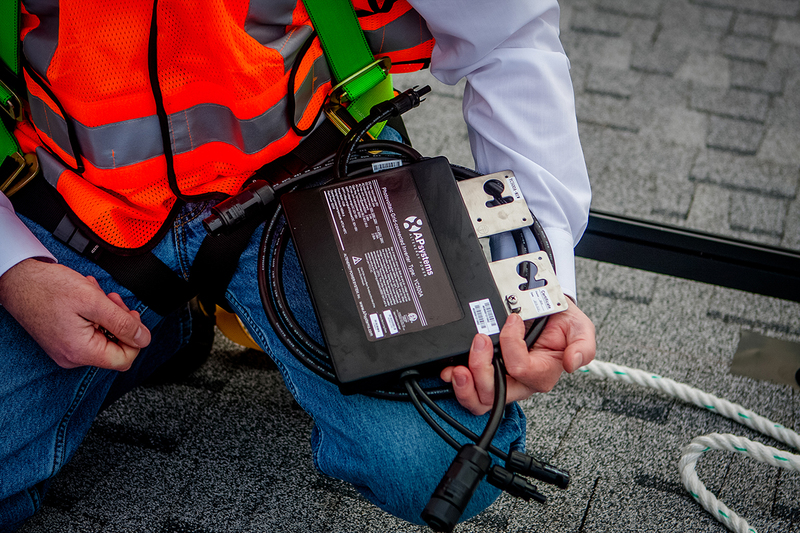 Also look for the article “Time Hacks for Installing MLPE,” features labor-saving tips and tricks for solar installers, and a report on the rapid-shutdown features built into the Blue Frog/APsystems microinverter platform. 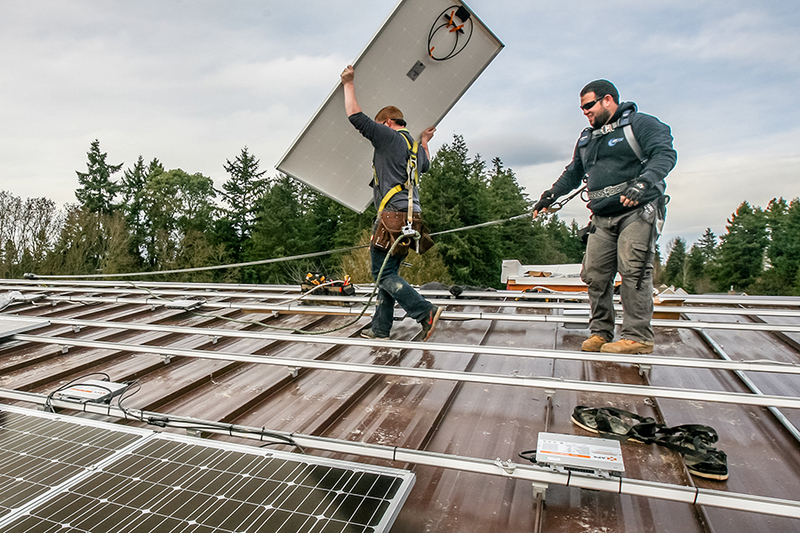 The report’s photo spread features the team from A&R Solar on the roof at Grow Community on Bainbridge Island, Washington’s largest planned solar community. On the day of the shoot, the A&R Solar crew was completing a multi-family building installation with APsystems YC1000 true 3-phase microinverters. Thanks to A&R Solar for working with Blue Frog on the great photo shoot! 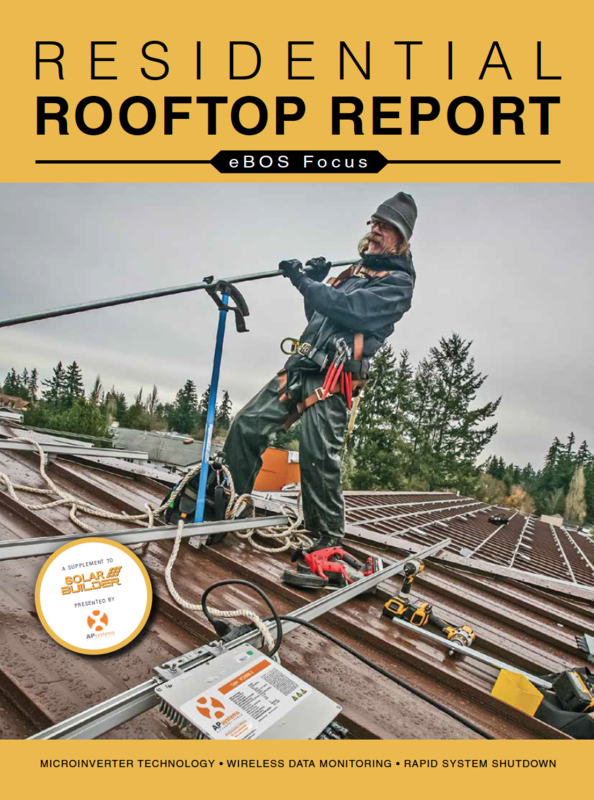 Find the “Rooftop Report” online here , and look for hard copies bundled with the next issue of Solar Builder Magazine, and distributed at the upcoming Solar Power International conference in September.